Are Dogs Descended From Wolves (Myth or Fact)? →Are Dogs Descended From Wolves? Is "man's best friend" really a wolf dressed up like a dog? If you ask your own pooch for her personal opinion on the subject, she may answer back, "Wolf, wolf!" But.... is she right? Are dogs descended from wolves? Well, as it turns out, not exactly, but kinda... How's that for a wishy washy answer!? LOL 🙂 The true answer is complicated and can't be answered with a "yes" or a "no" so let us explain. Many people point to the fact that gray wolves and dogs can mate and produce viable puppies (cubs) as proof that dogs and gray wolves are the same species. In fact, these "wolf dogs" or "wolf hybrids" as they are sometimes called, can also mate with other wolf dogs, other dogs, and other gray wolves and have viable offspring too! So, are dogs and gray wolves the same species? Well, not exactly, but kinda... We promise, we're going to clear this up so keep reading! Canis is the genus for all types of wolves and lupus is the species name for gray wolves specifically. Note: Scientists call domesticated dogs by the same name as gray wolves, Canis lupus, but they add another name behind this, familiaris. ​In the scientific world, this is to indicate that domesticated dogs, from Chihuahuas to Great Danes, are a SUBSPECIES of the gray wolf (Canis lupus). What does "subspecies" mean exactly? Honestly, scientists quibble over the exact definition of the term! However, generally speaking, in zoological nomenclature, a subspecies is a distinctive group within a species that has become geographically and or otherwise isolated from the broader species. Although the subspecies can mate and produce viable offspring with broader species, it doesn't happen in the wild much at all, and if it does, only at a very low rate. Over time, the subspecies will diverge in both physical and behavioral traits from the broader species and eventually become a new species incapable of successful mating with the broader species but this can take tens of thousands of years. Over those thousands of years that a subspecies is essentially isolated from the broader species, a few individuals from the subspecies may actually mate and have viable offspring with the broader species. So there is a trickle of gene flow which can make the formation of a new species from the subspecies really messy and even slower than would occur if there was actually COMPLETE isolation. And.... that's exactly what happened with early dogs and wolves! Dogs going back 10,000 years or more, would occasionally mate with wolves in the wild. In fact, they still do on very rare occasions when a dog and a gray wolf are actually in a position to do so. Also, humans sometimes get involved in this process by intentionally mating a wolf with a dog to create new breeds of dog. Wolf-dogs were, in fact, used in the development of the German Shepherd﻿﻿ as a breed of dog! As it turns out, the domestication process of the lovable dogs we know today is even more complicated! 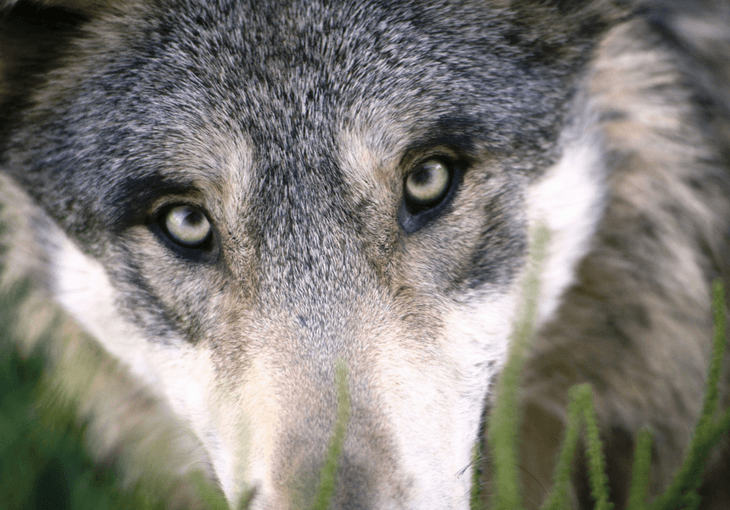 New evidence suggests that the dog, the "subspecies" of gray wolf that separated away from the broader Canis lupus, most likely started doing so from an ANCESTOR to the modern day gray wolf, not exactly from what we recognize as the gray wolf species today. This was reported in a scientific paper entitled, "Genome Sequencing Highlights the Dynamic Early History of Dogs," originally published in the January 2014 edition of the Public Library of Science (PLOS) Genetics Journal. This has MAJOR implications in HOW a wild CARNIVORE (the early dog) ever became domesticated in the first place. This is because the genetic diversity of this ANCESTOR to the modern day gray wolf is FAR GREATER than what scientists see in the DNA of gray wolf populations today! It would have been much easier for the genetic ancestors to gray wolves to domesticate into dogs than it would be for the gray wolves that live today to domesticate. When you compare dog DNA to gray wolf DNA, there are about thirty genes that vary A LOT and probably in a way that made domestication of the early dog possible. Several of these genes are active in the brain, and code for behavioral traits that turned the wild wolf, that is normally shy around humans, into the lovable creatures who beg to go on walks with us in the park and sleep in our beds! The other major dog genes that vary from wolves have to do with the ability to digest starch in a way that starch can become an important food source! This was best reported in a scientific article entitled, "The Genomic Signature of Dog Domestication Reveals Adaptation To a Starch-rich Diet," which appeared in the March 2013 issue of the prestigious journal, Nature. This collaborative study was led by Erik Axelsson and a team of scientists from Uppsala University in Sweden. For decades, scientists and archaeologists have postulated essentially the same dog origin story. Essentially, they said that dogs became domesticated right around the time that humans switched from being nomadic hunters and gatherers to a more sedentary agricultural lifestyle. Instead of hunting animals and picking berries (and wild onions, etc) for most of our food, we humans began to raise grain crops which were high in starch. The theory went that some wolves which happen to be able digest starch, due to their "accidental" gene variants for starch metabolism, were attracted to these early agrarian cultures and became "civilized" into dogs.... dogs that cozied up with humans got more food so the theory goes. The problem with the story above is that as new scientific evidence has been found, and when scientists really start looking into the details, the timing of the story above really doesn't fit well. Agriculture began about 10,000 years ago. However, fossils that look part wolf, part dog, were found in the Altai Mountains of Siberia and date back to around 33,000 years. Even if you consider the margin of error on dating these types of fossils, this is LONG before even the earliest agrarian societies! What's even more compelling is the DNA evidence that is presented in the PLOS Genetics paper cited above. Erik Axelsson and his team sequenced the DNA from gray wolves in China, Croatia, and Israel, plus the DNA from semi-feral dogs that have long been completely isolated from gray wolves (Basenji and Dingo), and compared this to the DNA of a number of modern dog breeds. What they found was strong DNA evidence that the dog subspecies began to diverge significantly from the broader gray wolf species somewhere between 11,000 and 16,000 years ago, probably closer to 16,000 years ago, BEFORE wide scale agriculture. They also find that old breeds of dogs that were developed to live alongside people who don't farm, and eat mostly meat from hunting, such as Siberian/Alaskan Huskies, do not have the same genetic diversity in their genes for starch digestion that most other modern breeds of dogs do. Well, first, the dog did not evolve directly from the gray wolf. It is a subspecies of the gray wolf, even today, that began to evolve from the ANCESTOR of the gray wolf which had far more genetic diversity than the modern day gray wolf. Second, the domestication of dogs, and their close association with humans, most likely began while humans were still hunting animals for food, not after they became grain farmers. So, it is far more likely that humans fed their early "dogs" scraps of meat and bone, and only later, did dogs develop the taste for grain, and the genes necessary to get good nutrition from grain, as their human friends began to farm grain on a wide scale.